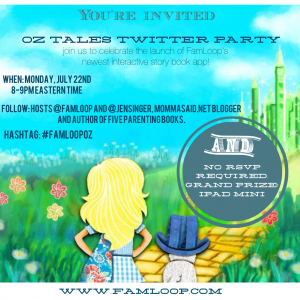 MommaSaid | Join the #FamLoopOz Twitter Party. Chance to Win an iPad Mini. Browse: Home / 2013 / July / 21 / Join the #FamLoopOz Twitter Party. Chance to Win an iPad Mini. Home is where the stories are shared. Like Dorothy says, there’s no place like home. Home is where families share their stories, and parents share storybooks with their kids. With new storybook apps from FamLoop, home is where your family’s stories are shared –whether that’s bed-side or from halfway across the world. FamLoop has launched OZ TALES, an interactive “story-game” that combines classic storytelling with modern mini-games built right into the story. We’re celebrating with a Twitter Party, giving away six iTunes cards and one grand prize of an iPad Mini. Join us! FOLLOW: Hosts @FamLoop and @JenSinger, MommaSaid.net blogger and author of five parenting books. HASHTAG: #FamLoopOZ No RSVP required.